Water is vital to digestion and metabolism, acting as a medium for various enzymatic and chemical reactions in the body. It carries nutrients and oxygen to the cells through the blood, regulates body temperature and lubricates our joints (which is particularly important if you're arthritic, have chronic muscular-skeletal problems or are athletically active. Man's metabolism is a complicated biomechanical process in which food is broken down and turned into energy. Every person should know about it. You should know this biomechanical process consumes calories, and water in your body is the fuel of driving metabolism's chemical reactions. So the more you drink the more calories you burn. Drinking enough water can make your metabolism work at high speed. Water is unbelievable. Over 66% of our body weight is nothing but water. And when it comes to weight loss water plays an important role. You see, water helps to flush toxins out of our bodies. Cleaning out our systems leaving us feeling healthier. Drinking water will stop your body stressing out and retaining water and fat. 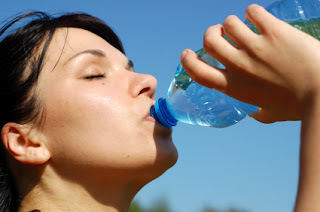 If you do not drink enough water your body thinks that it must retain more and you cannot lose weight. Obese people do retain a lot of water, which will add to your weight. You should drink at least 8 glasses of water a day, plus a little more if you are overweight. This will satiate your body and allow it to release water and fat cells. Losing weight is not only about drinking water, but it's also important to eat the right thing while you're drinking water. A combination of good food with water is the natural way of gaining control over our weight. Some people think that drinking water on its own will do it. Well, it does, but it leads to more harm than good. Let's look at some good foods to accompany with water. Another reason why water makes for a great ally in weight loss is that sometimes when we feel hungry we are actually thirsty. The brain confuses the two signals because food contains water too. So if we go back a little, this thing may actually be responsible for obesity. Our brain is confused and instead of asking for water, it asks for more food, which we gladly provide.